Before departing on my week-long visit to Charleston, one of the places I was most excited about photographing was Boone Hall Plantation. Built on a land grant of 470 acres that was given to Major John Boone in 1681, the estate originally featured a wooden house that was built in 1790 but has long since been lost. In its place there now stands a grandiose and, to my eye, rather vulgar Colonial-Revival style house that was constructed in 1935 by the estate’s then owner, a Canadian named Thomas Stone. Far more interesting than the house, which I studiously avoided photographing other than in soft focus (second image), were the nine original slave cabins, which date from 1790 – 1810. 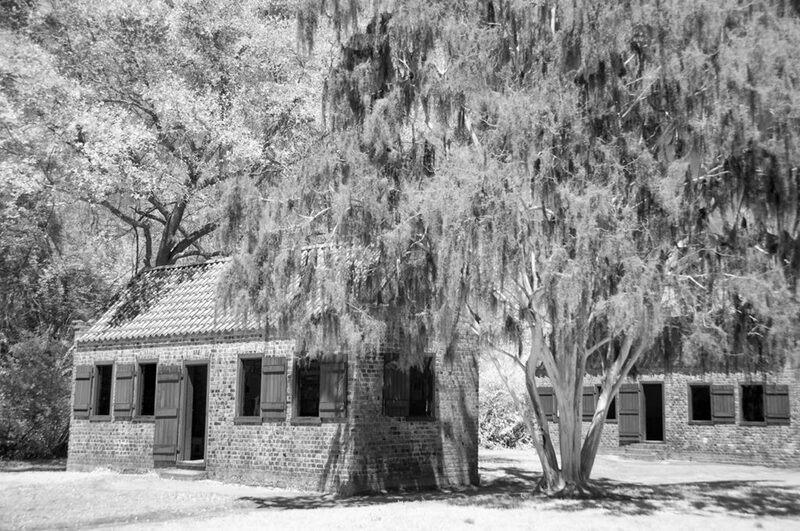 Built to house the slaves who picked the plantation’s cotton crop, these simple, brick-built structures are located outside the walled and gated compound on which the main house stands. Built of red brick with simple wooden shutters, with no glass in the window frames, I can imagine these cabins must have been chilly and damp in winter and sweltering hot in the steamy Southern summers. I couldn’t help but wonder why the original estate house had been built of wood, yet the slave quarters were built of brick. The slave cabins have stood the test of time. One of Boone Hall’s signature features is the Avenue of Oaks (lead image). 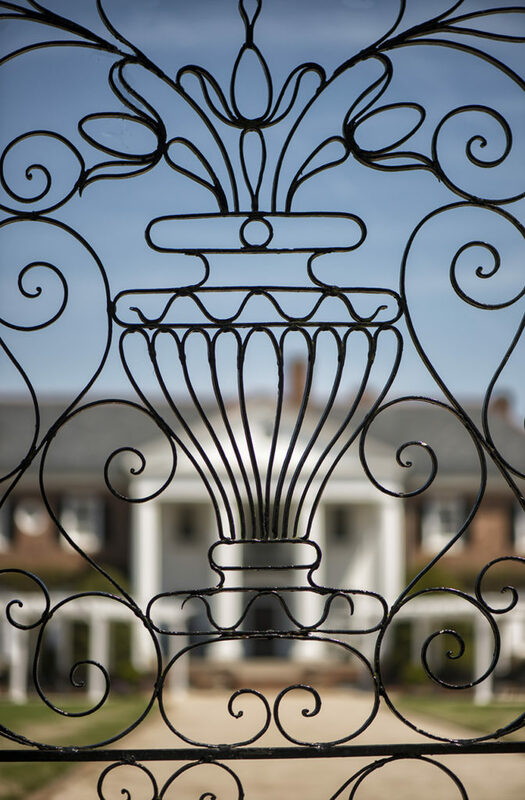 Planted in 1743, the two parallel lines of oak trees took more than a hundred years to meet above the dirt road that runs for three quarters of a mile from the entrance to the plantation to the gates of the main house. I had been inspired by many beautiful images of these oak trees that I had seen by Charleston-based photographers, Kate Silvia and Mark Wickliffe and was keen to photograph them myself. But, on the morning I was there, the bright sun and cloudless sky cast a harsh, contrasty light onto the oak trees and imprinted deep shadows on to dirt road below. How I would have preferred a cloudy day, with soft, diffuse light to show the trees at their best. This wasn’t the image I had been dreaming of creating but it was the image I captured on the one day I visited Boone Hall Plantation. Driving along Route 174 in Edisto Island, South Carolina, I spotted this abandoned house, clearly visible by the side of the road. It was one of those moments where you either hit the brakes immediately or let the moment pass and drive on. But a couple of miles down the road, I started to get that familiar nagging feeling in my gut that this was a subject that I would long regret not photographing, if I didn’t stop. So, I stopped, turned the car around, drove back and parked across the street. Looking more closely at the properly, I could see that, in addition to the abandoned house, there was a much newer house built on the same plot, a few hundred yards further back from the road. And the signs were that it was inhabited. There are always risks to walking on to private property to take photographs. 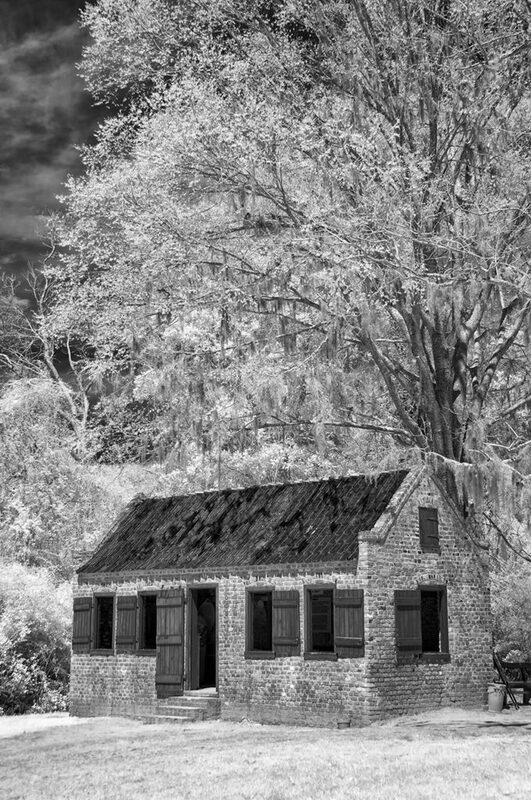 Especially, I had discovered, in rural South Carolina, where, a few days earlier, I had had an unpleasant encounter with an angry homeowner, who gave me hell about daring to walk on to his private property to take a photograph of a dilapidated building. This time, I was luckier. As I walked up the path to the occupied house, a charming African American lady came out to greet me. Though she seemed to have difficulty, at first, in understanding my interest in the old house, I eventually succeeded in explaining to her that I saw great beauty in the house and believed it to be a worthy subject to photograph. Once we got over that hurdle, the lady relaxed and began to recount something of the story of the house. It seems the old wooden home had been built in the mid-1700s by her great-great-grandfather, Simon Reed, and his son, James. Both had been farmers. Four generations of the Reed family subsequently lived in the house and, indeed, it remained occupied right up until the late 1990s, when the new home was built on the same plot of land. Casting my eye around the plot, I spotted a small, broken tricycle, which the lady said had once belonged to her grandson, long since grown. It seemed the perfect prop to complement the ramshackle house in creating a story-telling image about the family that had once lived in the old house. 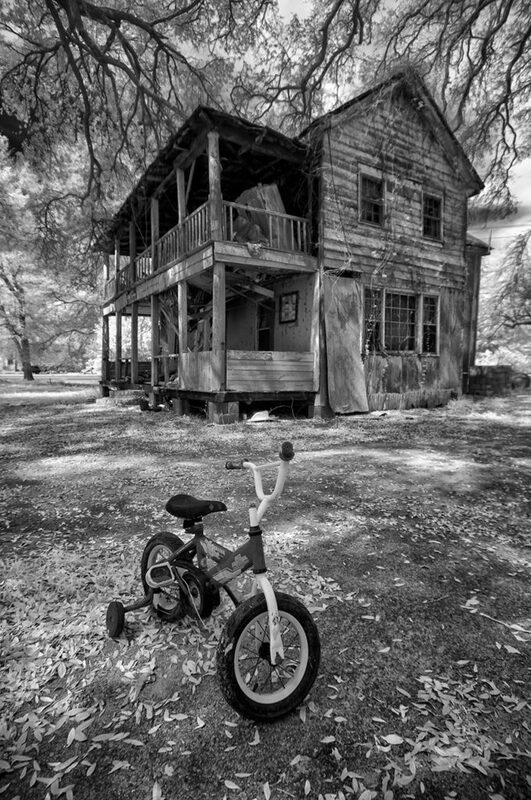 So, I placed the tricycle in the foreground and, looking around for the best composition, I noticed that the limbs of an adjacent tree were overhanging the roof of the house, so I included them in the top of the composition, both to fill the frame and to accentuate the eerie feel of the image. This image was shot in infrared on a Nikon D90, converted to 590nm, custom white balance, at ISO200, f4 at 1/800th second, using a 12-24mm lens. It was processed in Adobe Photoshop CC and converted to B&W in Nik Silver Efex Pro 2. 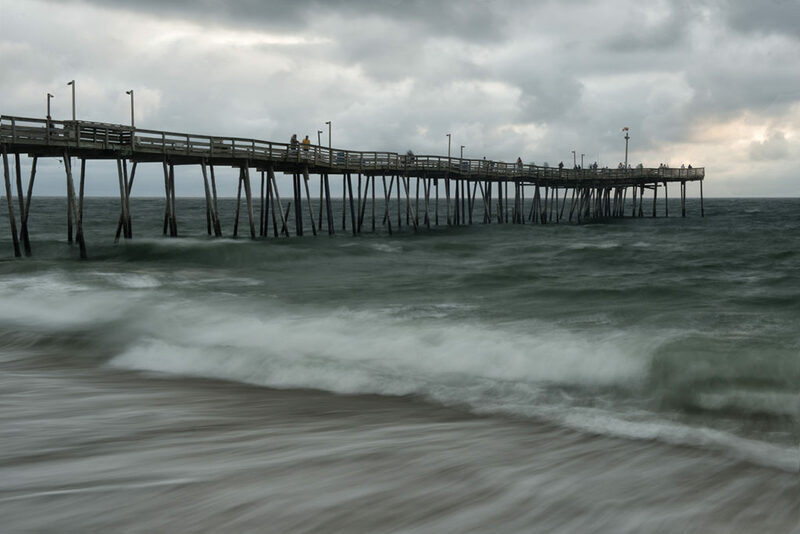 On a recent visit to North Carolina’s Outer Banks, I made sure to visit one of my favourite locations: the Avalon Pier in Kill Devil Hills. 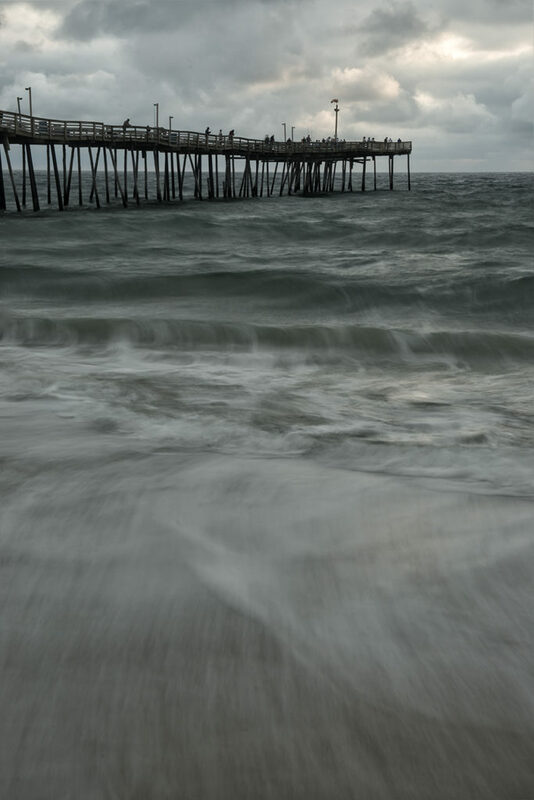 I arrived at the pier at around 5.15am, about twenty minutes before sunrise. Not that I could see the sun rise: the sky was an unbroken tapestry of dark, heavy clouds; a mass of ominous greys and blues. While I had been hoping for a pretty pink-purple sunrise, I found myself looking at a surly ocean roiling under a leaden, taciturn sky. This was not a promising scene for creating worthwhile images. 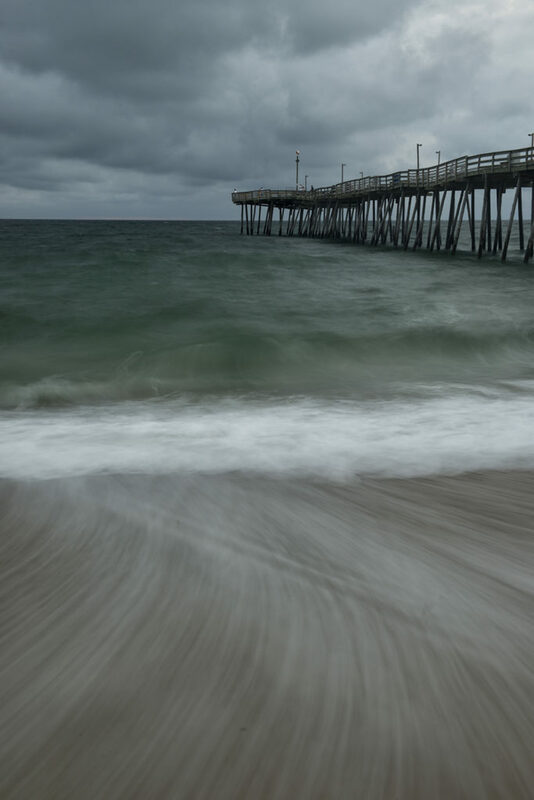 Yet, I could see some advantage in the dramatic clouds and heavy, rolling waves, as I knew that a slow exposure would lend them a pleasing blur and further darken the already surly mood of the ocean. This was a perfect setting of capturing the swoosh of retreating waves, as they flow back from the shoreline into the breaking surf. By trial and error, I figured out that the best way to capture this kind of image is to wait until an on-rushing wave has crested on the sand, then trip the shutter just as the water starts to flow back down the beach into the surf. This is how to create those dramatic lines that lead the eye from of the bottom of the frame into the image. By adding a three-stop neutral density filter to my lens, I managed to create even greater blur by achieving shutter speeds of 1 to 1.6 seconds. The other lesson I learned about creating this kind of image was to follow the pattern of the waves breaking on the beach. The high point of the breakers was constantly shifting and, when I found myself in the wrong spot, the bottom edge of my frame was made up of nothing but dry sand, which was not the look I was seeking to create. So, I learned that it was essential to move sideways along the beach, to find the point where the tide broke highest on the beach, and also to advance into the surf, to fill the frame with retreating breakers.